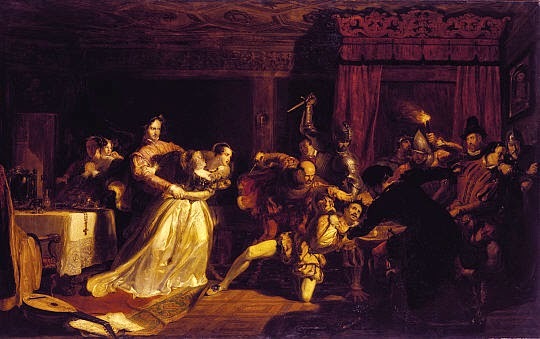 On 9th March 1566, David Rizzio, Mary Queen of Scots’ private secretary, was assassinated in front of the heavily pregnant Queen. Many consider it the beginning of the end for Mary. But why? And who was Rizzio? What had he done to deserve such a fate? David Riccio di Pancalieri was born in 1533 in the duchy of Savoy. The son of a poor musician, Rizzio inherited a strong musical talent and a beautiful singing voice. He was hired by the Duke of Savoy as valet and musician and, in 1561, together with his master’s ambassador, the Marquess of Moretto, went to Scotland. Here, the Marquess encouraged Rizzio to try and land a job at court. It just so happened that Queen Mary was looking for a bass singer. Rizzio performed for her and the Queen was so impressed, she hired him as a gentleman of the privy chamber. But if Mary was smitten, others were less than impressed. Many at court considered Rizzio ugly, thought him arrogant and conceited, criticized his taste for expensive clothes, and were jealous of the favour the Queen showed him. Few were pleased when, in 1564 Mary fired her French secretary Raulett, a retainer of the Guise family (her relations on her mother’s side) and gave the job to Rizzio. Rizzio was constantly in the Queen’s presence, carrying out this or that duty. The other courtiers soon learned that the best way to receive a favour from Mary was to bribe Rizzio. Many did, but resented his influence. Mary was aware of this, but she didn’t take their resentment seriously enough. She thought it was unjustified. The following year, the dashing Henry Stuart, Lord Darnley, arrived at the Scottish court. Mary quickly fell in love with him, and wanted to marry him. Rizzio, who, if rumours are to be believed fancied Darnley too (the two men were apparently caught in bed together! ), supported the marriage. The wedding was celebrated on 29 July 1565 at the Palace of Holyroodhouse. But the Queens’ hopes for a good and peaceful union were soon disappointed. Any happiness she may have felt at becoming pregnant with the future James VI of Scotland and I of England was marred by her husband’s outrageous behaviour. Shortly after the wedding, Darnley started showing his true colours. He was immature, weak, loved drinking and whoring, and longed to be made king of Scotland. Mary didn’t think he deserved it, which just infuriated Darnley more. For the plan to work, the Scottish Lords needed a scapegoat. 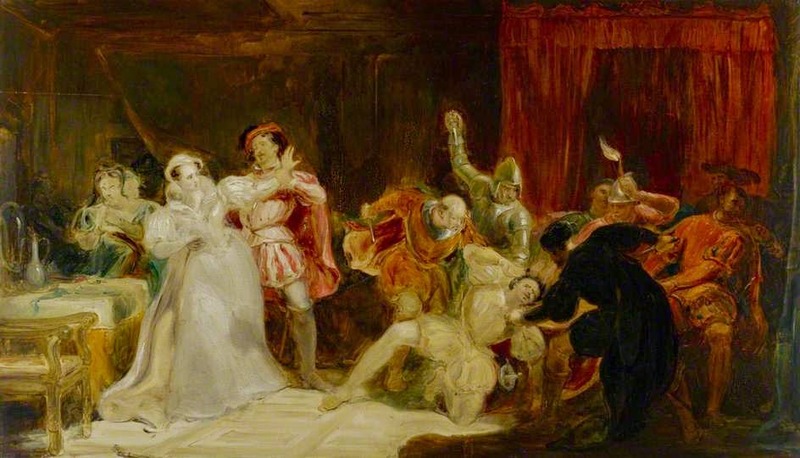 After promising him they would make him king, they convinced Darnley that Rizzio had mislead him, orchestrated the rebellion, and even slept with his wife. They started spreading rumours that the baby the Queen was carrying was Rizzio’s, not Darnley’s. Her husband soon became suspicious of all the time Mary was spending with her secretary. Even when they weren’t working, they were always together, dining and playing cards into the early hours of the morning. Darnley felt ignored, and complained bitterly to Mary. Then, he decided to join the plotters. As soon as Parliament opened, the conspirators acted. On 9 June, Rizzio was having dinner with the Queen and her half-sister, the countess of Argyll, in a small closet just off her bedchamber in the tower of the Palace of Holyroodhouse. Suddenly, Darnley joined them, sitting down next to Mary, embracing her and chatting amiably with her. He was supposed to reassure her, but probably just unnerved her. Next, the earl of Ruthven, deadly pale and still sick (he had just arisen from his sickbed and was still wearing his nightshirt under his coat of armour), came in too and shouted that Rizzio had offended her honour. Both the Queen and Rizzio suddenly realised the gravity of the situation. Terrified, Rizzio hid behind Mary, clinging to her skirts for protection. But the Queen was helpless. 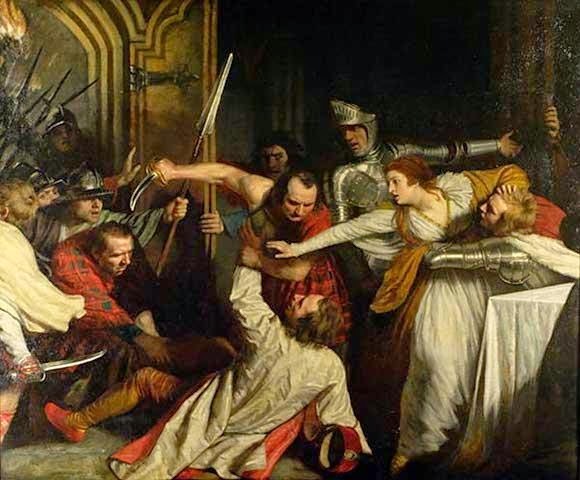 Her attendants tried to get rid of Ruthven, but now the Earl of Morten’s barged in too. As Andrew Ker of Fawdonside aimed his pistol at the Queen’s pregnant belly, George Douglas, Darnley’s uncle, using his nephew’s dagger, stabbed Rizzio. The victim, still begging Mary for help, was then dragged into Mary’s outer chamber, and stabbed 56 times. His corpse, upon Darnley’s orders, was thrown down the main staircase and taken into the porter’s lodge. Mary was traumatised by the event, but still lucid enough to realise she had been the real target. She also knew she would now be a prisoner and, so started planning her escape. She managed to see Darnley alone and convinced him the child she was carrying was his. At this point, Darnley had also begun to realise the Scottish Lords had used him and had no intention of ever making him king. Two nights after the murder, the royal couple escaped, through an underground passage, from Holyroodhouse to the fortress of Dunbar Castle. But Mary never forgave Darnley and, when a year later, he was killed, people thought she had something to do with it. She was forced to abdicate. But that’s a story for another post.